James has made tremendous contributions to this forum. His tagline reads: Resident Problem Synthesiser and he has done plenty of that... he has often been a pain in the, um, er, keyboard as he pushes and stretches Simio to do more things with it. Sometimes this means reporting bugs or asking difficult to answer questions . But more often he identifies opportunities to improve Simio and posts them to give us a permanent record as well as the opportunity to collect other user feedback. Along the way James has accumulated a great knowledgebase and he is always forthcoming to share that knowledge with others. He often steps in to answer problems posted by novices and experts alike and often contributes to interesting discussions. On behalf of Simio and our user form members - THANK YOU JAMES DORAN! You have made significant contributions to both the Simio forum and the Simio software. A small token of our appreciation is on its way to you. Ah shucks Dave. Thanks for the call out. I enjoy using Simio, as it is one of the premier simulation tools, and I would like to see it become the standard "go-to" tool for general simulation purposes. I have a vested interest in steering development towards mining purposes, so at times I am sure that what I was requesting might have been a polar opposite to the direction you intended to take development for general purposes. That being said, out of the massive list of suggestions I have made over the last year, a good portion have been added. I trust Simio will continue to grow and mature, and I hope to play a small part in this happening... even if it is only to throw peanuts from the gallery. 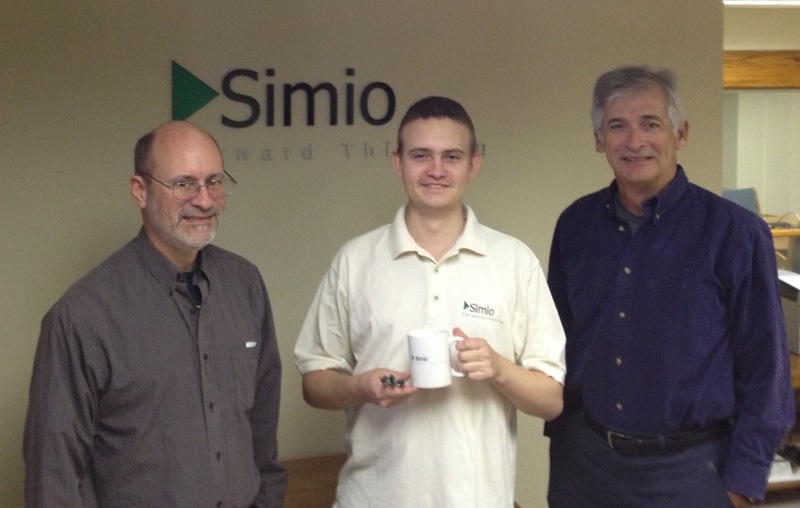 James Doran, along with Dave Sturrock and Dennis Pegden, is shown wearing and hoding some souvenirs from Simio. Congratulations, James Doran. We always expect your valuable comments in this forum.